The direction of Ubuntu & Gnome with their graphical interfaces . . .
FTP 40 Years Old Today . . .
Well, recently we’ve seen some interesting developments. Canonical (makers of Ubuntu Linux) have come out with their latest version of Ubuntu (11.04), featuring their new default desktop interface called Unity. Meanwhile, the folks over at Gnome have also come out with Gnome 3, replacing the amazingly popular Gnome 2.x style interface. Boy, they look pretty similar, don’t they? Both of them are chasing Apple’s OS X interface for some reason. I’m not a big fan of Apple’s interface and I’m very much not a fan of what Canonical and Gnome are doing with my desktop. While Ubuntu 11.04 offers an “Ubuntu Classic” mode (read Gnome 2.x mode here), this will only be around for 11.04. Once 11.10 comes out in 6 months, the “classic” will be discarded. The people over at Linux Mint (the second most popular Linux after the Ubuntu family) have stated that they will adopt Gnome 3, but without the Gnome 3 shell (which is the interface that is presented to the user, AKA “The Desktop”.) I’m not sure exactly how they will do that, but I am sure it will require a lot of custom coding. Ubuntu has always offered me the perfect blend of Debian’s rock solid stability with my choice of the latest & greatest apps pre-installed. I’ve enjoyed using it for a few years now, however, forcing the Unity interface on users who’ve enjoyed the classic desktop is too much for me to bear. I know in some way Canonical’s hand was forced here in that Gnome was already abandoning it’s 2.x desktop, so instead of moving with Gnome’s 3.x shell, they decided to create their own version of an astonishingly similar, child-like desktop. Both interfaces are wrong for the desktop and wrong for the power user. The developers at Gnome are equally guilty of abandoning the classic, best desktop, forcing a completely different interface on its users without the choice & option of what I suppose has to now be called “Gnome Classic”. It’s a mistake to offer users change without choice. For those who may think all is lost at this point: DON’T PANIC, I know where my towel is located. In my effort to find a new home for myself, I started selectively searching through the myriad of Debian-based Linux distributions. I tried Linux Mint and while it’s based on Debian, I don’t think it’s my cup of tea. On a hunch I tried Xubuntu (Ubuntu with the XFCE desktop instead of Gnome). I’ve always regarded XFCE as a Gnome knock off with less polish. Certainly, XFCE has come a long way, but it isn’t as intuitive as Gnome 2.x. Having said that I am reluctantly choosing Xubuntu as my distro of choice. XFCE is close enough that I can bridge the gap with some tweaking. I am mostly tweaking the panels. 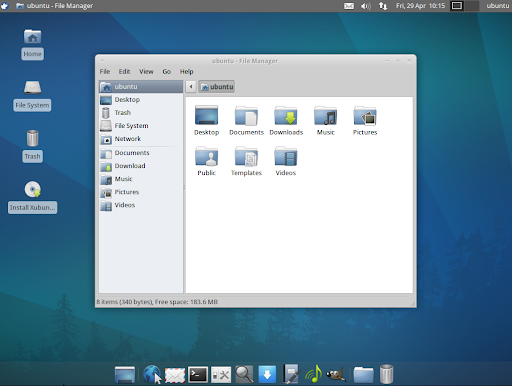 The default bottom panel that comes with Xubuntu 11.04 is useless in my estimation. I’ve deleted that in favor of a fresh panel with simply a Window Menu, Workspace Switcher & Trashcan. I’ve removed the Window Menu from the top panel and added some quick-click launcher icons at the upper left of the panel to launch often-run apps such as Chrome, Xchat, File Manager, Calculator, etc. All tweaks aside, Xubuntu allows me to maintain the advantage of the Ubuntu line of repositories (including medibuntu!) while offering me a desktop that is much more familiar. For me, Xubuntu is the safest bet for a new home. One should not confuse a desktop interface with an entire Linux distribution. I could easily run Ubuntu 11.04 and just install the XFCE desktop onto Ubuntu and then choose XFCE as my default desktop under Ubuntu, instead of running Xubuntu. I do think though, that while that approach may work, the folks over at Xubuntu have integrated XFCE a bit better into the Ubuntu base than I could. It would allow me to cleanly run a variant of Ubuntu without the extra Unity baggage and enjoy an overall lighter distribution as well. The plethora of support offered in the great Ubuntu Linux community was also an important factor in my decision. Fortunately, Xubuntu is so close to Ubuntu that all the forum posts out there supporting Ubuntu will also work for Xubuntu as well. Sure, there may be some Xubuntu-specific issues with which to deal, but the grand majority of forum posts specific to Ubuntu will also address questions for the Xubuntu user. This is very much a personal decision. Some are sticking it out with Ubuntu and the Unity interface. Others are installing Gnome 3, replacing Unity. Yet others are switching over to KDE . . . mmmkay . . . ya . . . I’m not a KDE fan. I always thought KDE was chasing the Windows “start menu” concept and I generally don’t care for their desktop. Others still are abandoning Ubuntu altogether and switching over to Fedora or OpenSuSE. I am sticking with Debian, and with Ubuntu — just in the Xubuntu camp. Ultimately I hope Gnome 2.x finds a home with an active bunch of developers (or gets ported to GTK 3.x!!) so that I can re-adopt it. Though I fear that the decade old, rock solid Gnome 2.x desktop may be dead: wow. Apparently, there’s no desktop for old men. The forums are afire with posts similar to this blog post (though maybe with or without the Xubuntu choice). I hope to find some camaraderie on the IRC with some folks and see where this goes. This may not be the last post on this topic. One of the great things about Linux is choice. I wish Gnome hadn’t made their choice to abandon their 2.x interface and I wish that Canonical hadn’t forced Unity on their users, but as a member of the Linux community I can exercise my own choice and adopt Xubuntu with the XFCE desktop as my new home. I hope others in the community will not let the Gnome 2.x interface die, either by forking it or porting it over to GTK 3.x. I’d very much like to return to it, but until then, goodbye to the “original” Ubuntu and to Gnome: so long and thanks for the fish. First you’ll have to install VLC, Audacious, VNC, VINO, Chrome, LibreOffice, Screen, Nautilus, Gconf-editor, NFS server and client, SSH, SSHFS, ECryptFS, Samba, SmbFS, RDesktop, EOG (Eye of Gnome Pic Viewer), Imagemagick and perhaps a few other things I haven’t yet come across. 1. XFCE didn’t auto-create a menu item when I installed Chrome, so I had to add it manually. Add a launcher to the panel (right click the panel, go down to panel –> Add new items), then select Launcher. Once selected, a blank square will appear on the panel at the far right, and will have a light grey/black box. Right click that new box on the panel, click Properties. Then to use Nautilus as your default file manager, go to Settings Manager –> Preferred Applications –> Utilities Tab, then select Nautilus from the File Manager pulldown menu. If you prefer a /text/path/to/your/files instead of the graphical button style in Nautilus, the quick fix is to run gconf-editor from the command prompt, then in the configuration editor and navigate down to: apps –> nautilus –> preferences –> always_use_location_entry and make sure to check that box off. 3. I also had problems VNCing into my new Xubuntu install. To fix this, just install Vino.